On a recent Sunday afternoon while I was away from London on business, I heard the BBC was planning to drive a Mini-E from London to Edinburgh, over 400 miles. Though the Mini-E is a prototype with some inconveniences common to early “beta” designs, I happen to think it’s a great little car. I even applied to trial one twice – as it would be perfect for my daily commuting needs – and I know that at least one Tesla owner runs one as his family’s second everyday car. That is, until I clicked on the link to their story and saw a map proposing it would take four days to make the journey. Reporter Brian Milligan claimed his aim “was to try this challenge with a mass-market car, and to use it to test the charging network more than the car itself.” But, by limiting themselves to 13 Amp public charge points designed for around-town “top-offs,” the BBC seemed intent on making the Mini-E (and by implication, all mass-market EVs) look impractical. The BBC neglected to explain to their readers and viewers that the Mini-E doesn’t actually represent mass market EVs: It cannot be bought. It has no back seats. Its British trial was to last only 12 months. The community was outraged. Something had to be done. The Tesla Roadster, on the other hand, is a mature design and well-engineered car that can take almost anything nature and the road throw at it. The 2.5 model is the best yet. Tesla’s policy of incremental improvement has made for a solid product. I drove a Roadster on a tour of Southern England last year, so I already had a good feel for the car’s capabilities on long distance trips, and I’ve seen how the car has gotten better with every release. Following developments on the BBC stunt online, I felt sure that the Roadster could comfortably do the trip in a day if the right charge locations were available. I’d heard on the grapevine that there was an owner near Nottingham with a High Power Wall Connector, and I knew there was 32A charging at Tebay Services, a local, family owned service station. I calculated that was enough to do the trip in a day with a 6 AM start. All I needed was a Roadster and a driver. I started making calls and sending emails. Who better to take on the BBC than actor and EV-advocate Robert Llewellyn? He was busy. What about other famous pro-EV faces such as Quentin Wilson or Ben Collins? With the North American International Auto Show in full flow, they couldn’t make it either. 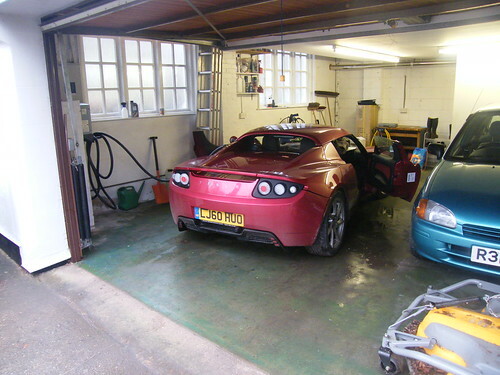 Then Tesla suggested I do it in a Roadster borrowed from the London Store. Me? I was in Norway for business. The story gained traction. Within the EV community and on the Tesla Motors Club Forum, more agreed: something had to be done. I had to say yes. 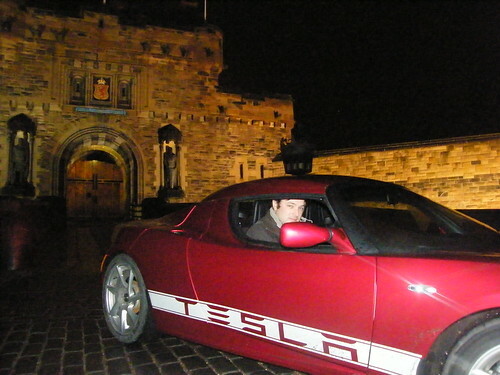 With a 6AM start the next day and just two stops at charge locations, a one-day trip to Edinburgh was feasible. The Roadster could do it; but, could I? Still in Norway at 6PM on Tuesday, I rearranged flights and got time off work. Five hours later, I was back in London and charging locations were confirmed. It was a true testament to the support for the growing EV movement. 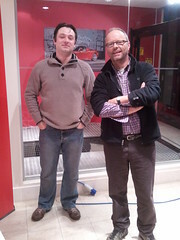 Early the next morning, we met the Tesla crew and Robert Llewellyn at the London Store. Robert conducted a quick interview for Fully Charged. After well-wishes and promises to tweet, my co-pilot (read: wonderful girlfriend) Khadine and I were off. Once on the motorway, we made steady progress north. Within three and a half hours we had passed both Milton Keynes and the Mini-E’s first overnight charge stop in Leicester. As we pulled off the M1 in Nottingham, Roadster Owner Patrick Bird was waiting to show us the way to his home, equipped with a High Power Wall Connector. I’d never used a High Power Wall Connector before, but it’s truly impressive to watch it quickly charge the car with electricity. The car recharged on a 64 Amp supply, and 3.5 hours later, it was ready for the next leg. Our host couldn’t have been more welcoming or supportive of our challenge. We learned that Patrick is a sports car guy at heart. While he isn’t really “plugged in” to the whole EV scene and had been a “Porsche guy” for years, he said he could never go back to a combustion car. Back on the road, heading north involved crossing the Pennine hills to Manchester .The scenery was beautiful, but there was no stopping us. We continued up the M6 to Tebay Services in the Lake District, Cumbria. We arrived at Tebay at 4:20 PM and plugged straight in to a 32 Amp outlet. We had a welcoming committee – everyone from the Managing Director, down – and for many it was love at first sight. The Roadster has that magical effect on people. Tebay is fantastic – it is the only motorway service station in the UK that is family run and it specialises in local produce, and great hospitality. It was a welcome opportunity to relax after the rush of the previous evening. By that time, Robert had cut the morning’s video and put a special episode of Fully Charged online. He’d also tweeted about the challenge and recommended that his followers watch my Twitter feed for updates. There’s nothing like that sort of recommendation to get your email inbox overflowing! I quickly had messages of support from EV fans and Tesla employees the world over. The BBC was rattled. They not only requested my contact details, but seen fit to post that our challenge was unfair, not representative of mass market EVs’ capabilities and akin to flying from London to Scotland in a Eurofighter (that’s a fast military jet). It is openly known that Roadster costs £90k. Given that the Mini-E is a prototype, no one is sure how much it costs. But is its cost the real issue? We didn’t think so. To us, the trip wasn’t pitting Roadster against the Mini-E. It was instead providing an alternative example of what EVs can provide to drivers today. Although its leading technology is out of the price range for most (including me), the Roadster is paving the way for EVs to come. Why not use it to rally against biased media? Claiming the Mini-E is a state-of-the-art mass market EV without mentioning the LEAF, the Renault ZE cars, the Focus electric, the BYD e6, the Mercedes A-Class E-Cell, the Toyota Rav4 EV and of course the Tesla Model S is unforgivably duplicitous journalism. It took six hours to fill the car with exactly the range we needed to get to Edinburgh (I longed for another High Power Wall Connector), a straightforward 133 miles. Or so we thought. Mother Nature was not feeling friendly. The fog was thick. We nearly missed the “Welcome to Scotland” sign. The scenery was nothing but a white blur and the Roadster’s navigation system was our only reassurance that we were making good progress north. As we climbed up to Beattock on the M74 – as severe a gradient as you are likely to see on the motorway – we next encountered snow. The last 44 miles to Edinburgh are on a twisting, single carriageway road called the A702. Despite weather conditions and late hour, it was a welcome relief from the monotony of the empty motorway. We’d arranged for my friend Andrew to meet us at the city limits. We met at the “Edinburgh” sign just as the car went into “range uncertain” mode. In all the excitement, I’d neglected to confirm with Andrew that the goal was Edinburgh Castle! There was just enough juice in my phone to call him and shout “castle” before it died. We sneaked onto the Castle Esplanade, backed up to the door, grabbed the shots and cleared off before any armed soldiers noticed. A fast, quiet car is exactly the tool for the job. Within seconds, the photo was online and those following on Twitter and Tesla Motors Club knew we had scored a victory over biased journalism. The next morning we drove the Roadster back to the castle. The BBC’s map stated that their last leg was going to take two hours, so we expected them to arrive in Edinburgh in time for their breakfast TV programme. But at 8 o’clock, they announced there was to be a full report on Friday’s show. Where were they? Despite getting my contact details, the BBC never did try to call me. Instead, we managed to get Brian Milligan on the phone: they’d diverted via Berwick-upon-Tweed to find a charge point. He was apparently not happy about our stunt, didn’t want to meet, and certainly didn’t want to debate the rights and wrongs of using a prototype to show the public what a “mass market” EV can and cannot do. And while we were told that the Mini-E was going back to London on a trailer, there was no way my Tesla was doing the same. I had to be in Ireland in two days time for my Grandfather’s birthday party. I had expected to retrace my steps and then have to fly to Ireland, but my time in the Roadster gave me the confidence to contemplate something much more fun: arriving by road. By the end of next year, the UK will have 4,000 charging posts across the country. Your car's sat nav will guide you straight to them, so there'll be no time wasted while you hunt for them. When you plug in, your car will get an 80 percent charge in just 20 minutes. Meanwhile fuel prices continue to rise.